To celebrate getting old I’ve gone down to a 3 day working weekend. Having worked Mondays since the age of 16 this is my first Monday off. Time to prepare for our trip to Longleat Caravan Club Site tomorrow. The Boss started work at silly O’Clock this morning and walks through the door just before 11am and decides he wants to go today! A day early! I’m not ready to go but am I ever. Quick phone call to secure an extra night, fridge emptied into the boot of the car and we’re off! All within an hour of him coming home. Earlier in the week we had extra internal and external sockets fitted. We will be able to test them out on this trip. Its a bit of a pain only having 3 internal sockets, hopefully the extra 2 will make a difference. Longleat is our chosen site this time, the start of our 50th birthday celebrations. I keep getting reminded by The Boss that I am going to hit this landmark before him. I’m not bothered I still look younger than him. Longleat has the Festival of Lights on over the Christmas period, a nimals and lights what more could a girl ask for? 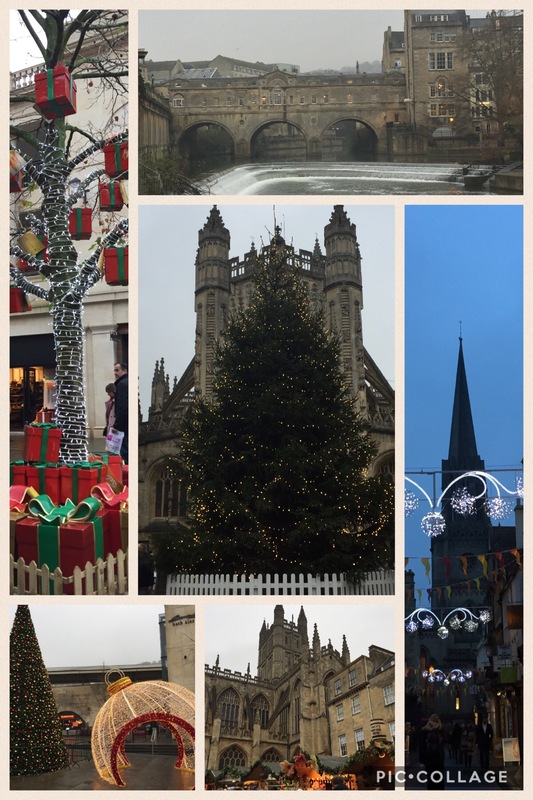 Christmas Market in Bath whilst we’re here maybe? We’ll see. Arrival at the site in less than 2 hours of leaving the house. My midweek weekend has started and a day longer than normal. A lovely warden in warm reception welcomed us on this particularly frosty December afternoon. No phone signal here but the site does have Club wifi so we’ll be ok. With approximately 165 pitches it’s quite a big site but very spacious and well planted with mature trees and shrubs. 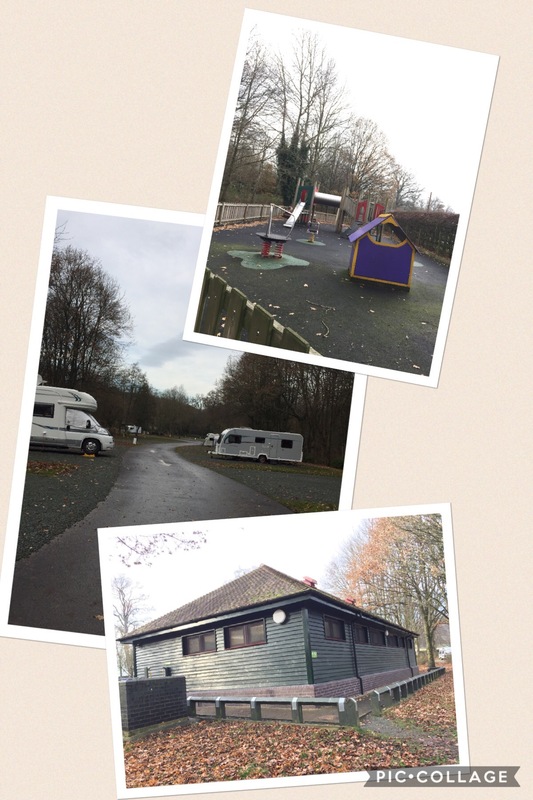 With 2 toilet blocks, a play area and a dog walk most people are catered for. There’s a separate block housing a laundry and the most well stocked information office I’ve ever seen. 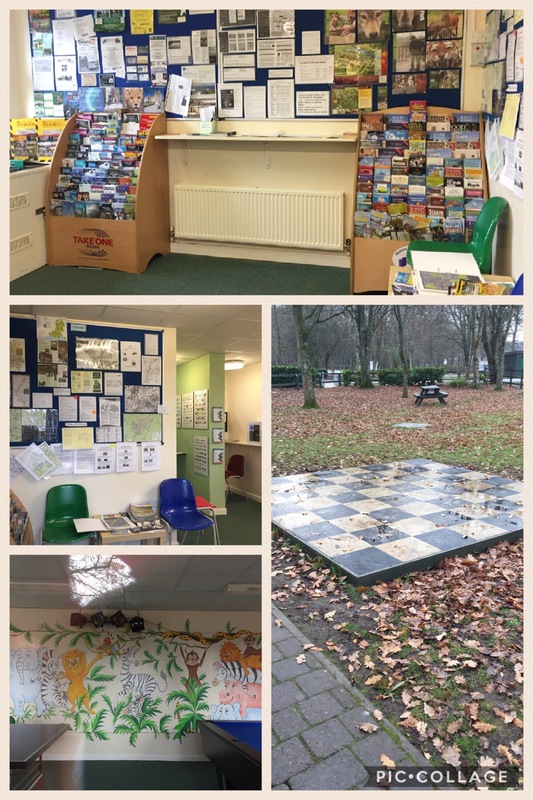 Also within the block is a family games room, a lovely addition to the site, complete with huge outdoor chess board. I defy anyone to say there’s nothing to do in this area. Despite being extremely cold and December, I’m pleased to see the site is busy. Quick set up, doesn’t take long and we both crack on. Just before the daylight gives way to a beautiful sunset we take our obligatory trundle round the site. In the distance we can hear animals from the safari park settling down for the night. 3.30am and The Boss is up, bathroom light on and he’s tutting. It seems that whilst I’ve been sleeping he’s been persecuted by water torture. The shower is dripping. Now that I can hear it in the dead of night that’s all I can hear too. Whilst he’s on his hands and knees trying to locate the drip. I fling our bedroom window open and stick my head out. What on earth was that? A fog cloaks the site making it impossible to see more than a few feet. Our pitch backs onto the Safari Park. It’s quiet and still again then all of a sudden I’m sure it’s a lion. A magnificent roar, oh my god this is so much better than being wakened by bird song. Drip sorted, back to bed. No more roaring but I insist on sleeping with the window open so that I can hear any of the other animals shouting as they wake up. Apart from the odd animal noise the only sound I can identify is that of a snoring hippopotamus, or is that noise coming from within the caravan? Wakened to a mizzle, mix of mist and drizzle. A proper mucky day. Just before lunchtime and daylight still hasn’t honoured us with it’s presence. Despite being gloomy it is very mild compared to the last few days. Bath Christmas Market beckons us. Car park signs warn on the drive in that they are all FULL and that there is heavy congestion. Cue, tutting again from The Boss, shouldn’t be heading into Bath at this time of year… Whose idea was this? On we go on roads that aren’t congested, maybe we’ll hit it when we get closer. Our eldest Jellybean lived in Bath for 3 years whilst at University so we are familiar with the roads. We head to our usual car park and had a choice of parking spots and no congestion at all. Bath is everything I wanted it to be. Completely festive. The Christmas market offers gifts and the most wonderful mix of culinary aromas. Carol singers serenade us with the old favourites. A large double decker bus, complete with outdoor seating and blankets offers an assortment of warm alcoholic beverages, would be rude not to wouldn’t it! Spiced mulled wine in hand, time to watch the world go by. A trip to the Safari Park and the Festival of Lights is planned for the following day. Book online with the Caravan Club and get a discount on the entry price. Lunch was quickly snaffled and off we went. Straight to the ticket booth, no queues and we drive towards the African Village. This is your last stop for supplies and a wee before entering the Safari Park. Cleverly set out this area is a place to stretch your legs and maybe let your kids run off some steam before confining them to the car for a couple of hours whilst you go in search of big game. This is also your chance to get up close and personal with Lemurs. 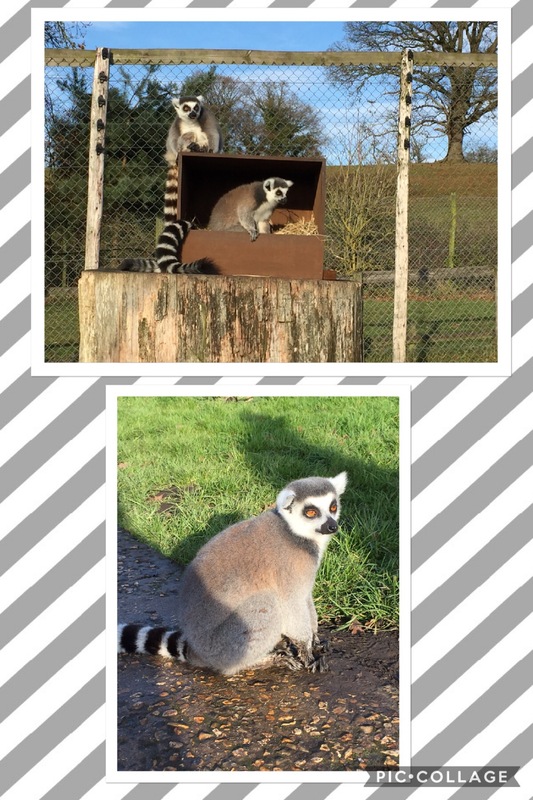 The Lemur enclosure is open for the public to walk through at their leisure as the lemurs wander about freely with no care to the folk that are in there with them. At this point my trip was complete, if The Boss had said it’s time to go home, I’d’ve gone quite happily. hoover up with a tickle. Into the ‘Big Cats’ section we are very lucky that our work/life balance puts us out of season at times like this. For many, this part can be a two lane traffic jam at crawling pace as the cars with the best view take a hundred photos oblivious to everyone else. Not today, we are in these sections no more than five cars at a time and can drive straight to each view point and sit and watch the Cats, who in turn, are watching ‘Meals on Wheels’ drive past them all day. The Boss realised he hadn’t locked the door at this point and decided it would be wise to lock it now, only to press the ‘down window’ button by mistake, that sure woke the wardens up, why he even bothered I don’t know, we all know cats don’t have thumbs. On leaving the Drive-Thru you park up at Longleat House & Grounds. We are specifically looking forward to the Light Festival but daylight is still gripping on so we head for the ‘Jungle Cruise’ which, out of season luck, was just boarding. The cruise takes you on a loop of the lake and the island that houses Nico, a 55 year old Gorilla. The crew were very animated that we got to see the Hippos both swimming in and exiting the lake to graze in the fields, either they say that to every boat load of peeps or we were indeed very lucky to see them. It is also at this point that you realise just how close the caravan site is, from the boat we could see our caravan through the trees and it became apparent that much of the animal noise we were hearing in the caravan was from the Gorilla House on the lake. We saved £1 as everyone else fed the seals swimming by the boat, and indeed the birds who would nick the fish from unwary peoples hands. Back on shore, a trip through the ground floor of the very splendid House and we are ready for ‘The Lights’. Wandering around the grounds and the light is starting to fail. 4pm is the official switch on time but a little man in a hi viz vest scuttles around switching them on early. An enormous birthday cake bearing a great big 50 on top celebrates Longleat’s 50th birthday. I like to think they put the cake there just for us, well, I can pretend can’t I? Animals from the Safari Park are shown partying and having fun whilst walking around to the front of the house you are transported to the world of Beatrix Potter, Peter Rabbit cheekily eats carrots in front of Mr McGregor whilst Jeremy Fisher sits fishing at the side of a pond. A particular highlight is the 50ft Singing Christmas Tree, spectacular when idle, but comes alive every half hour to deliver a Christmas story using the building as a video screen while bursting with lights and music. We were a bit thick at first mesmerised by the tree until we realised that the crowd were all looking the opposite way to us. We had failed to notice the animated story for the first couple of minutes. The lights are truly magical and transform Longleat grounds into a Winter Wonderland, this is no cheap Lapland spectacular in a muddy field with horns strapped onto Donkey’s heads, Longleat have got it right. Pretty lights and animals all in one place on the same day – perfection. The Festival of Lights runs until the 2nd January, 2017 and if you haven’t already visited then it is well worth it. Wish my hubster was as spontaneous as yours. I have to organise everything. My eldest daughter went to Bath Spa so we viisited Bath a few times. Bath sounds lovely for Christmas and good to hear you are appreciating your long weekends and making the most of them. We keep camping throughout the year otherwise I would go nuts! We are lucky here in Manchester to have such a huge Christmas market, the festive feeling is soon with us – you can stay at Burrs Country Park Caravan Club site and get the tram in to town if you fancy that another year. Wow! It looks you had a busy but fun weekend! Thank you for sharing what you did and where you stayed.